This week our serene Garden at the Ellen Schwartz and Jeremy Siegel Early Childhood Education Center was transformed into an open air market (mercado) complete with tables of food, juices, and festive decorations to celebrate the Spanish we have been learning. 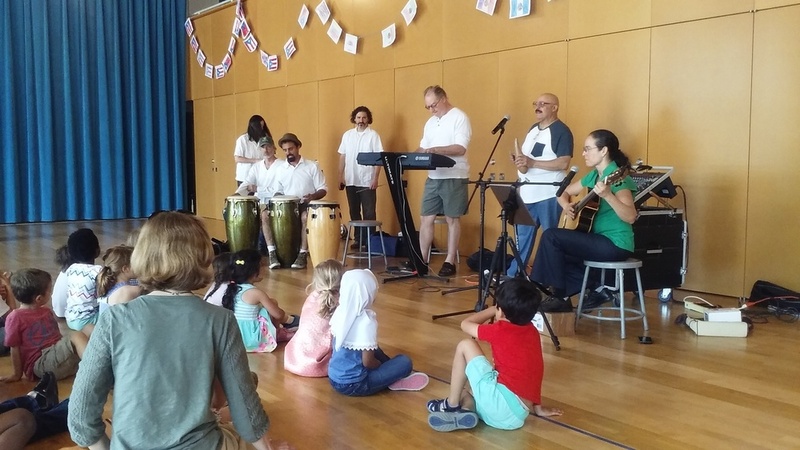 The mercado was filled with our youngest Spanish-speaking children – preschoolers and kindergarteners – who used Spanish phrases to ask for their treats and convey politeness—por favor and gracias! Children danced (baila, baila, baila), sang, and spoke in Spanish. They experienced first-hand the relevance of conversational Spanish as a way to meet needs and showcase all they’ve learned this year in our integrated Spanish program. Guest musician Magdaliz Roura played her guitar and retold the story of coquí, our beloved rainforest frog. Max J.s’ dad, Chris, joined us, and we danced to the rhythm of his powerful drums! Thank you to our Spanish-speaking parent volunteers and to early childhood teachers Madeline Leonard, Brian Jordan, Melissa Roldan-Stills, and Meg Waldron, who helped us make our mercado a great success!